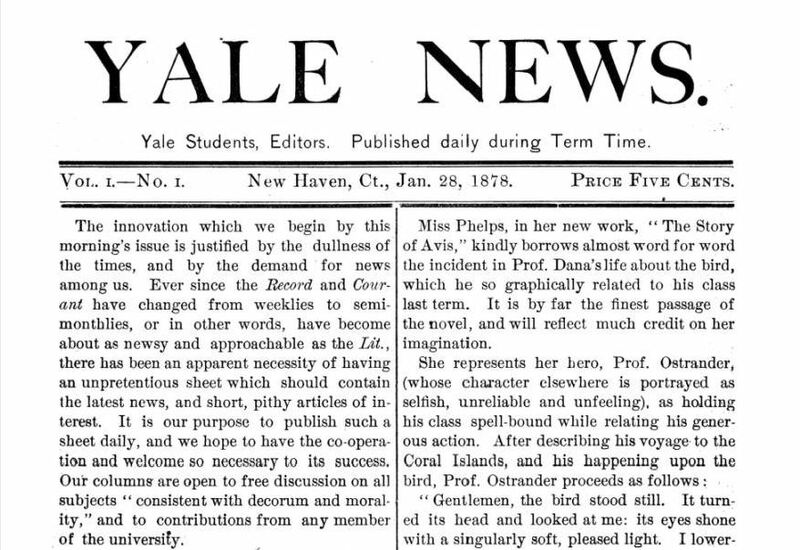 On January 28, 1878, the first edition of the Yale News proclaimed, “The innovation which we begin by this morning’s issue is justified by the dullness of the times, and by the demand for news among us.” Such dry wit would remain a hallmark of the publication, which later took its current name, Yale Daily News. Today, this student-produced publication is touted as the oldest college daily newspaper in the US. Depending on how one qualifies the claim—continuously published, independently run, and so forth—other schools also profess having the oldest college newspaper. Dartmouth College, for example, published the first issue of its newspaper in 1799 but it was not a daily. Are these soaps all one scent, boy? No marm, all ten cents. “The Yale Daily News Historical Archive.” Yale University Library, 2017. Link.